C. W. Tobie, chief criminal investigator for the Burns Detective Agency, formally withdrew from the Phagan investigation Tuesday morning. The calling off of the Burns forces was announced by Dan P. Lehon, superintendent of the Southern branch, after Tobie had stated explicitly that he would not withdraw from the case. Colonel Thomas B. Felder, who brought the Burns detectives into the Phagan case, would make no statement relative to their withdrawal but announced that it did not mean the end of his investigation or connection with the case. Tobie made up his mind last Friday to drop the Mary Phagan investigation so he said Tuesday—but deferred action until, Monday night, when he announced his intention to withdraw to Solicitor General Dorsey. Acute disgust at the “four or five cornered fuss” raised by the Phagan investigation was assigned by Tobie as the cause. This disgust was superinduced by the direct charge and general impression that the Burns Agency was pretending to ferret out the Phagan case, when in reality its purpose in Atlanta was to investigate the police department. 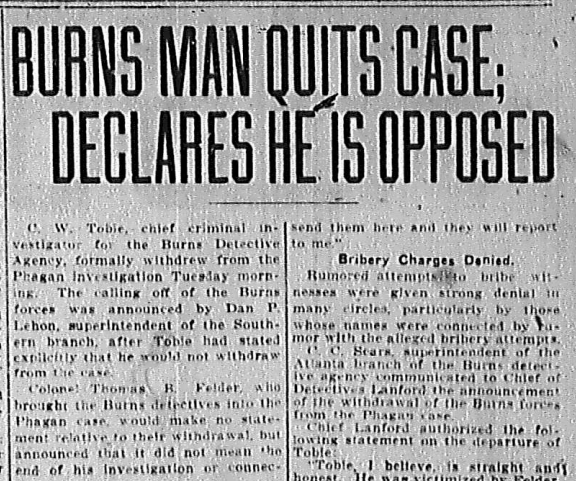 Tobie said to-day that while he has quit and was going to leave Atlanta, still the withdrawal of the Burns Agency need not be permanent. Tobie explained he believed Leo M. Frank was guilty of the Phagan murder and that the “certain features” meant additional clinching evidence not yet published that will make Frank’s conviction certain. “How can any house have harmony,” said Tobie, “when the old man is fighting the old woman, and the old woman is fighting the children, and they are all fighting the hired girl? That’s the shape this affair has gotten into, only worse. “Do you mean, then, that you were dissatisfied at Colonel Felder’s attitude?” [he] was asked. “We were dissatisfied with that part of it, yes,” was Tobie’s reply. Tobie reiterated he ended the investigation himself. “I called myself off,” he said. “Dan S. Lehon, our Southern superintendent, was close to Atlanta. It was as near for him to pass through here on his way back to New Orleans as it was for him to go any other way. I was in charge here, but, as you know, I do not belong to this territory. As a pure formality and a matter of courtesy, and because I knew he was coming here to visit his wife’s relatives, I sent him a message inviting him to confer with me. When he got here I told him as a courtesy that I had decided to quit the case. He approved it. Had I told him I would continue, he would have approved that, too. Rumored attempts to bribe witnesses were given strong denial in many circles, particularly by those whose names were connected by rumor with the alleged bribery attempts. C. C. Sears, superintendent of the Atlanta branch of the Burns detective agency communicated to Chief of Detectives Lanford the announcement of the withdrawal of the Burns forces from the Phagan case. “Nothing has ever been said of the girls of the pencil factory until after the terrible murder, but since then there has been one continuous talk, just as if we were to blame. We are just as anxious to see the guilty punished as the rest of the public, and we all loved Mary Phagan just as much as we possibly could. “If the public only would interest itself to look into other factories and stores they would find the girls in the pencil factory are just as good as any other working girls. “It looks mighty hard that we have to work in this place where our little friend was so horribly murdered, but we are only poor working girls, trying to make an honest living, and we try not to think of the tragedy any more than possible; and we have the interest of the factory too much at heart to desert in times of trouble.